This hoặc That (84) Nazz as a mature girl hoặc Nazz as a dumb blond? bạn think Edd and Kevin could make a cute couple? What do bạn think the age gap between Ed and Sarah is?. What do bạn think the age gap between Eddy and his brother is?. Edd wakes up from his giường from his CD player, playing the song It’s A New Day. Edd (smiling happily): I feel just like that song đã đưa ý kiến and that is it feels good to be alive. Edd jumps out of bed, got dressed hát the song he heard when he got up, and ran to Eddy’s house. Eddy pushes Edd away and gets out of giường mumbling to himself for not being able to sleep in. Eddy: Fine fine! I’m up already! Geez!Why are bạn so cheerful today? Ok, one ngày Double D was on his computer with a secret obsession, he loves to play Solitaire! It was a sunny ngày in the Cul-De-Sac. The kids were going to have a sleepover at Edds house. Sarah sits tiếp theo to Jimmy, while Ed sits tiếp theo to Eddy. Ed: Did bạn see Celebrity Death Match last night? Judy Garland beat up Marilyn Monroe. One ngày Edd woke up and looked at his clock. Ed: I don’t know! I was waiting for bạn so we could go see! One day, they heard a knock at their door. It was a lâu đài Carrier with an invitation from the castle. Edderella took the invitation, and quickly closed the door. Just as he was about to open the envelope, Stepbrother Eddy snatched it from his hand. He starts to read the invitation. One day, the Eds were walking down the đường phố, street slurping jawbreakers when they ran into Bernie Bernstein, the director from the Powerpuff Girls. Eddy: "What do bạn want?" One Day, Edd Spied A Moving van In The Cul-De-Sac.He Decided To Go Greet The Newcomers.He Went Over And Knocked On Their Door. A 12 năm Old With Short Red Hair, Wearing Glasses, Had Some Freckles, Greeted Him.The Look In Edd's Eyes Could Clearly State That He Was In Love. Michelle:Would bạn Like To Come In? "What an exhausting day!" he chuckled. "I didnt realize staring in a âm nhạc video would be so much work!" a comment was made to the question: What do bạn think is under Double D's hat? 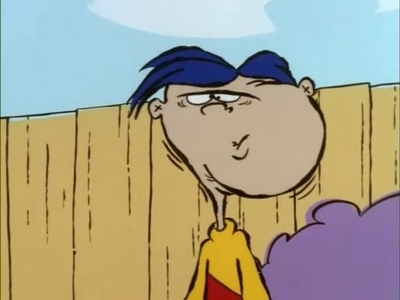 In The Episode "if it smells like an ed" what is Rolf Eating? Your yêu thích Ed,Edd n Eddy Quotes?